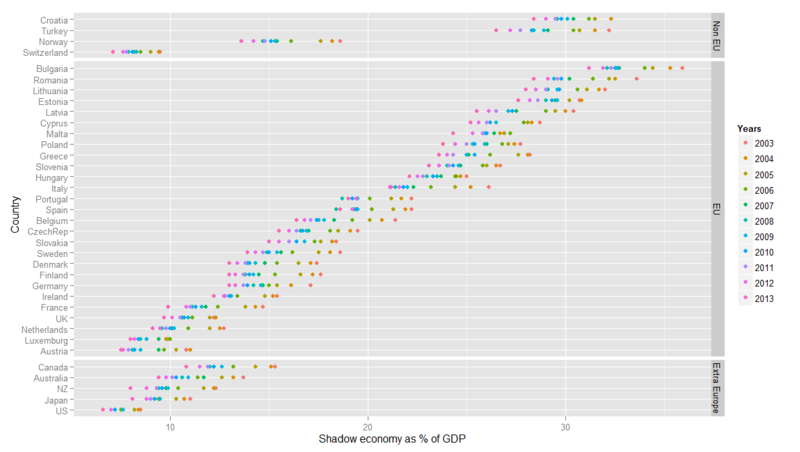 The so called shadow economy still matters and though it has gone down by a meaningful share of GDP in world economies it isn’t yet the shadow of what it used to be until a few years ago. 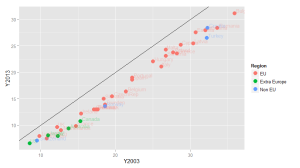 The art and science of gauging macroeconomic quantities tells us that nominal GDP (i.e. real GDP times prices) should equal the supply of money times its velocity in circulating within the economy. Equation  says that in formal terms, but what happens when evidence gathered by economists tells us a different story like the one in equation  where nominal GDP is smaller than it should be according to the former equality? Given prices (P), money supply (M) and its velocity (V) then real GDP is smaller that it should be and somebody might be dodging with taxes. It might be only an educated guess but increased evidence tells us that consumers and businesses like to hide the revenue service some transactions. Not all of them, of course. Only a few. Professor Schneider of the University of Linz in Austria is probably one of the most cited scholars of the shadow economy and has dedicated, to a great extent of his academic research, a lot of time in analyzing and measuring its impact in modern economies. AT Kearney, a consultancy, together with Visa, an electronic payment firm, and Prof. Schneider* have presented an update about the state of the shadow economy in Europe showing a stern recess in its share of GDP during the last decade. 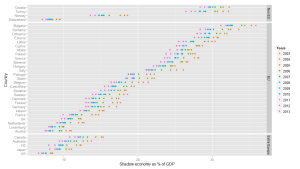 With additional data, always by Prof. Schneider, in the chart above I have charted a scatterplot showing the percentage of GDP estimated to be in the shadow economy during the last 10 years since 2003 for 37 countries. 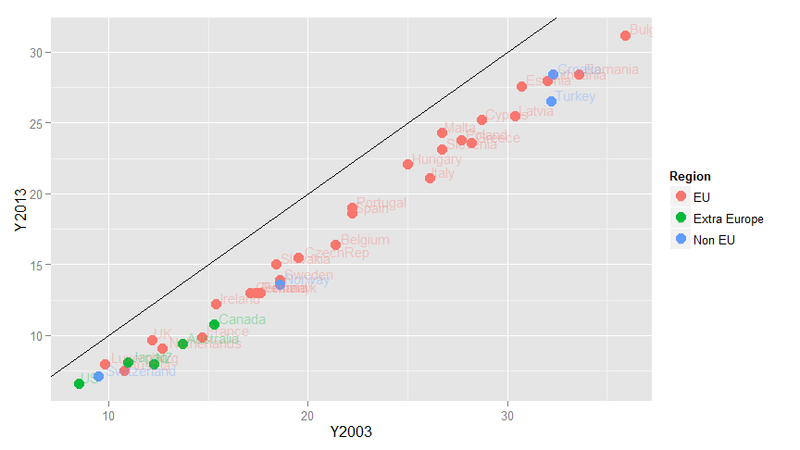 The underlying trend in the ratio of shadow economy to nominal GDP is altogether negative: all countries have seen this part of their economies go down – see chart below where the black line shows equality of this ratio comparing 2003 and 2013 data while all dots lie below meaning that 2013 shadow economy is lower than 2003. Though some countries see their shadow economy share of GDP in the range higher than 25%, the average ratio has gone down from 22.3% to 18.43% [§] within the EU economies alone. 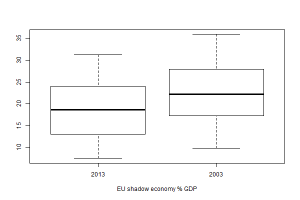 The ‘box and whisker’ plot below shows shadow economy has ‘gone down a step’ since 2013 and still will come down according to the international commitment by governments, policy makers and public institutions to squeeze it. The new Single European Payments Area, also known as SEPA, will be born on February 1, 2014, in the midst of the aftermath of a major financial shakedown that threatened to bring down the whole world on its knees. Consumers, businesses and public administrations across 33 nations, comprising all 28 EU members and 5 more countries, will find it easier to receive and make payments from and to other SEPA members. Though for consumers the impact at the outset will probably be hardly noticeable, SEPA promises to change dramatically and efficiently the way ‘big invoicers’ – such as utility companies e.g. – and governments – collection of payments covers hundreds of millions of transactions each year only for Italy, e.g. – manage their wholesale transactions as opposed to retail ones by households. The shadow economy and its primary lubricant, cash, will probably falter even more as on February 1, 2014, SEPA comes into office for banks (the main actors), corporations and the public administration. The need for keeping track of all transactions in and out of our pockets poses a great threat to the dark side of our economies: who knows if SEPA will shed some light on the shadow economy? 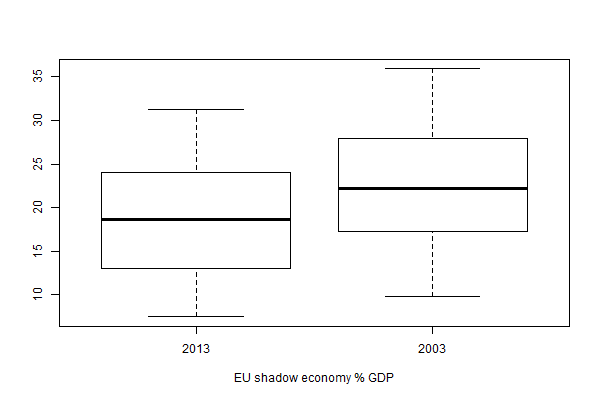 * The shadow economy in Europe, 2013, http://bit.ly/1e24ijJ.